What Is Turmeric & Where Do You Get It? The turmeric plant, a relative of ginger root, grows primarily in India, China and Africa. It gives curry its bright yellow color and bitter flavor. As an herb seasoning, turmeric appears in countless dishes in India. The root or rhizome has a rich supply of curcumin, which has disease prevention and healing properties, according to the Brain Research Institute at the University of California at Los Angeles. Ground turmeric is available in the spice section of most grocery stores or online from health food distributors. Turmeric adds flavor to soups, stews, casseroles, vegetables and meats in the Indo-Asian world, but most notably in India. The Indians also sprinkle turmeric on their bandages to enhance the healing process of a wound, infection or rash. 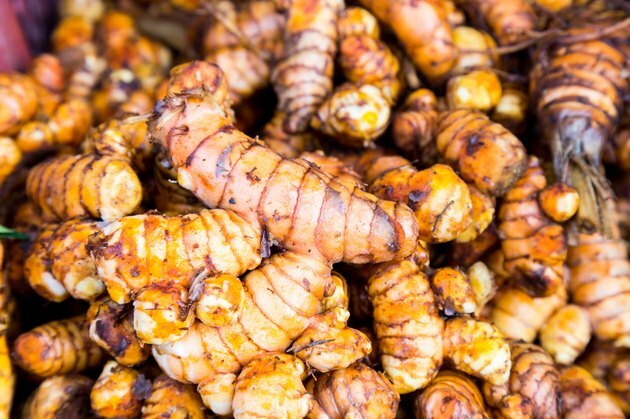 They gargle with turmeric to help laryngitis and swallow the herb to treat bronchitis and chronic diseases. The bitter root holds promise as a treatment for Alzheimer's disease, Parkinson's disease and certain cancers, due to its abundance of antioxidants, according to UCLA. People from the East already use turmeric for gastrointestinal discomfort, liver problems, gallbladder disorders, headache, bronchitis, colds, lung infections, fibromyalgia, fever, menstrual problems and depression, according to MedlinePlus. In mice, curcumin, the ingredient in turmeric, blocks the development of skin cancer and inhibits the spread of some breast cancers. Further study mixed turmeric with Taxol, a chemotherapy with serious side effects. The researchers found a decrease in the occurrence and severity of the unwanted effects of this drug, according to UCLA. Another study in mice done in 2004 suggested that curcumin might lessen the effects of Alzheimer's disease. UCLA reports this prompted human study. The scientists at UCLA designed the first study to assess curcumin on people afflicted with Alzheimer's disease. Thirty-six patients taking part in this study consume large doses of curcumin to see how well the body absorbs and utilizes the potent antioxidant. Other research by Johns Hopkins University and the University of Washington examines whether curcumin would have positive effects on cystic fibrosis therapy. The impetus for this study was the positive results from a study of mice with this lung condition. Additionally, researchers from Medical College of Georgia state that turmeric can reduce the severity of hemorrhagic stroke by reducing the size of the blood clot responsible, reports Science Daily. Turmeric is used extensively by Eastern cultures where people have statistically lower incidences of many cancers, heart disease and Alzheimer's disease. Illnesses that thrive on inflammatory conditions are also less common in the East. Turmeric reduces inflammation in the body, thus giving it enormous potential in fighting disease. Minimal side effects occur from using turmeric in food or as household remedies. At extremely high doses, using turmeric/curcumin medicinally carries some risk of side effects, which include indigestion, nausea and diarrhea. Although safe for the liver, turmeric may cause people with gallbladder trouble to have a worsening of their symptoms, according to the National Center for Complementary and Alternative Medicine.